As the year comes to end and we see the start of a variety of festivities designed to celebrate your daughters and her accomplishments here at Mercy, we want to remind you about several upcoming events. Parents invited and encouraged to attend May 23 and August 24. Arrival time change for the SANP and a link to the three forms needed to attend the SANP. Brief survey regarding the graduation DVD. At last we have reached spring temperatures and the school is beginning to buzz with end of year activities! Our seniors are preparing for the traditions that await their graduation celebrations, spring sports and clubs are in full swing, and plans are being put into place to ensure our continued academic and enrichment student opportunities for our next school year. All Star Driver Education & Driving School will be providing driver's training classes at Mercy. The session will begin on Monday, May 7. Class will meet Monday through Thursday for 3 weeks from 3:00pm-5:00pm in S-23. (05/07, 05/08, 05/09, 05/10, 05/14, 05/15, 05/16, 05/17, 05/21, 05/22, 05/23, 05/24) Promo materials are in the Counseling Office, Media Center, and Reception Area. This is a reminder that the Financial Aid process in now underway at Mercy High School. To be considered for financial aid, you must complete and submit the application requirements by the April 30, 2018 deadline. 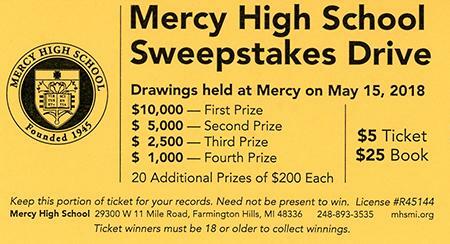 THANK YOU for supporting the Mercy High School Sweepstakes Drive and helping to raise over $150,000! Please note there is no school Friday, May 18th as part of reaching the final incentive goal day off for the Sweepstakes Drive. CONGRATS to all our top school sellers! At last we rounded the corner to spring and anticipate new beginnings! Registration for the next academic school year is well underway, spring season sports are in session and planning continues for programs that will continue to enhance experiences for our Mercy girls. WE ARE PROUD TO ANNOUNCE THE MERCYAIRES WILL BE PERFORMING THE NATIONAL ANTHEM AT THE GAME!